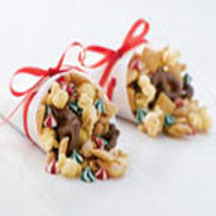 Need something to make during the busy holiday season for that 'last minute' party invite? This snack is easy to make, delicious to eat, and tastes like you spent a lot of time in the kitchen. Preheat oven to 250°F (120°C). Grease large roasting pan. Mix cereal, popped popcorn and peanuts in large bowl. Pour into prepared pan. Combine brown sugar, butter and corn syrup in medium, heavy-duty saucepan. Bring to a boil over medium heat, stirring constantly. Boil, without stirring, for 5 minutes. Remove from heat; stir in vanilla extract and baking soda. Pour evenly over cereal mixture; stir to coat evenly. Bake for 45 minutes, stirring every 15 minutes. Cool completely in pan, stirring frequently to break apart mixture. Stir in morsels and pretzels. Store in airtight container.